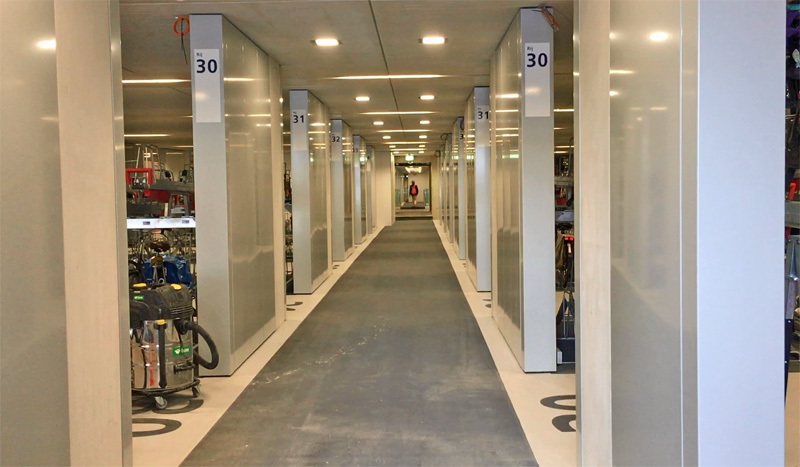 Utrecht has opened –what will become– the largest bicycle parking facility in the world. The first 6,000 spaces can be used now, another 1,500 will become available by the end of this year and the full 12,500 spaces can be used by the end of 2018*. By that time, this Utrecht bike parking garage will have surpassed the Tokyo Kasai facility –current largest in the world– that has room for 9,400 bicycles. Until then it already is the biggest in the Netherlands. The north-entrance is the only entrance so far. It is obvious that the facility is in the middle of a building site. Clearly visible is the scaffolding necessary to build the roof high above the new station square. The escalators, the elevator and the stairs will all lead to that new square. 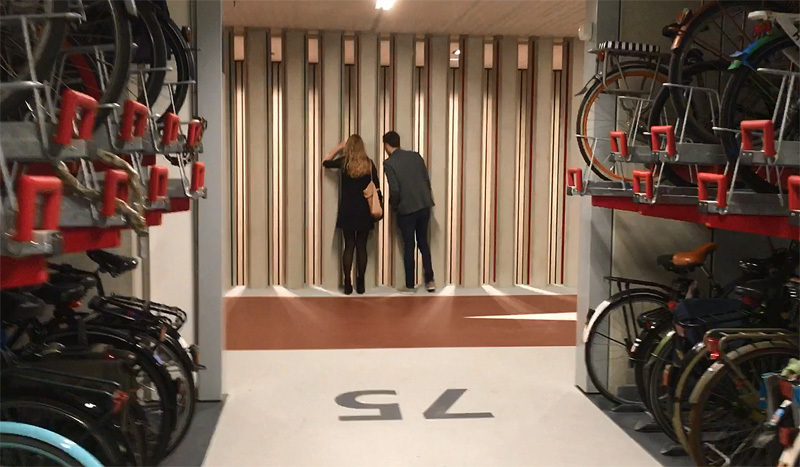 This bicycle parking garage is so big that the design had to allow cycling inside. It would otherwise take too much time to push your bicycle to the nearest available parking space. That gives the facility a distinct different look and feel compared to most other Dutch bicycle parking garages. What it has in common are the large open spaces and the fact that it is very well lit, making it clean and bright. Apart from ample parking spaces for standard Dutch bicycles in two-tier racks, there is also room to park cargo bikes, bikes with baskets and bicycles with children’s seats. Finally, the facility has a much needed and very large OV-Fiets bike hire station with 720 new Public-Transport-bikes on offer. From this picture it becomes clear that the building itself is also not entirely finished yet. 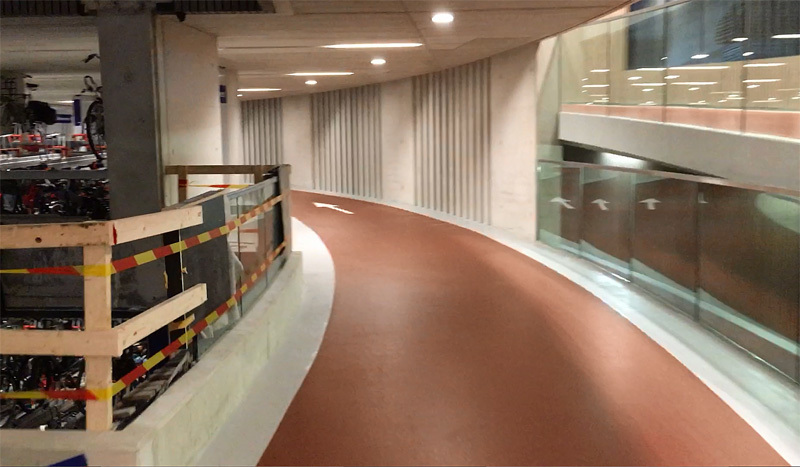 This is one of the cycleways, inside the building, that people can use to ride to other floors. The facility needs to be opened in phases due to its location; right under the new station square that is currently being built in Utrecht. The thousands of travellers arriving in Utrecht daily need to be able to reach their destinations on foot at all times. It is a giant puzzle of where what can be taken away first to make room for something new. Building for this garage started in July 2014, but first the bus station with the taxi platform on top of it, that used to be at this location, had to be demolished, which meant the buses and the taxis had to have a new place first. Now the first part is ready, the station square on top of the bicycle parking garage can be built. Once that is finished (by the end of this year) people can use that square in their new walking routes and the structures with the original routes can be demolished. That is where the last one-third of the facility needs to be built. Underneath those 1970s elevated walkways, builders are already doing ground works. Once the original structures can be taken away, new parts will already be all around those old structures. This rendering, from the site of the architects, shows the new station area. I marked the approximate location of the bicycle parking facilty -squeezed in between so many other (new) buildings- with the red rectangle. Last week’s opening of the facility attracted a lot of attention, also abroad. Large numbers always speak to the imagination, but the Guardian was most struck by the fact that the Dutch didn’t seem to see this as a success. Walking routes are kept away from the cycleways in the parking garage. Fortunately, the figures are a bit better than that. This facility is one of many around Utrecht Centraal. In total, there will be 33,000 bicycle parking spaces before the year 2020, but indeed, that won’t still be enough to satisfy the demand. It is good that the Cyclists’ Union does its job well in asking for more attention and planning for cycling. There was more criticism. In a letter to the editor of Volkskrant the new facility was called a “consequence of failed urban planning”. The writer of the letter thinks the burden of bicycle parking should be spread more over the entire city with more –smaller scale– destinations and to other stations as well. “Well organised suburban stations would decrease the pressure on the central station and would prevent the need of such mega bicycle parking facilities.” That there is some criticism doesn’t mean the people in Utrecht are not proud of this facility; they are and rightly so. Not least because it is so space efficient. Some even think that if the same amount of space –that can accommodate 6,000 bicycles– had been used to park cars, it could hold a mere 150 vehicles. There is a huge interest for the new Utrecht bicycle parking facility. People walked around to have a look. The bike parking garage was tested some weeks before the opening by a group of lucky people at the end of July. It wasn’t revealed if there were some last-minute changes after this test, but in a way the whole facility is still in a testing phase. Many things are still missing. A system that will guide you to free spaces has yet to be installed. Screens that will tell you when the trains leave will also come later. The complete routing in the garage will have to be changed. Future exits for walking to the station square (not finished yet) cannot be used and because one-third of the building is still missing, a ramp to cycle to the other floors is also partly not there yet. This problem was cleverly solved with temporary stairs, half-way on the ramp that was already built, to walk. Of course the stairs have grooves to push your bike to those other floors. Two tunnels offering a direct walking route to the tunnels under the railway platforms, have already been opened in the basement. Cross section of the three floors of the new facility (click to enlarge). Picture from the site of the architects. The top one-third of every floor has yet to be built. 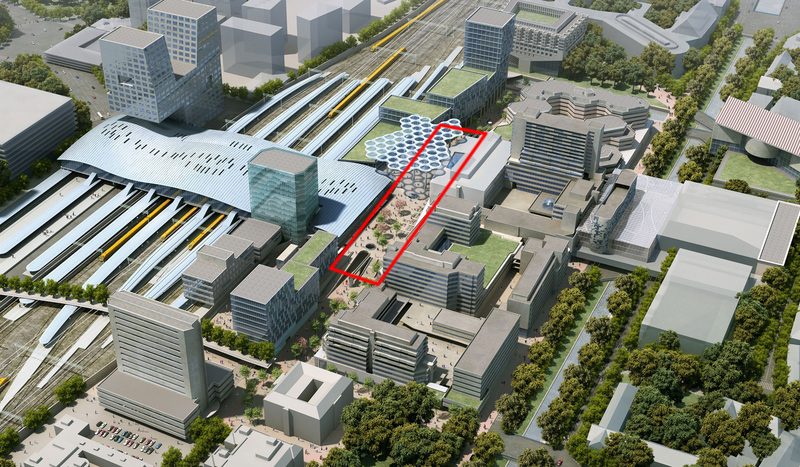 The parking facility is a joint project from the city of Utrecht and both railway companies. The railways run it now and that means they impose their rules of conduct on the visitors. I was soon to find out what that means. There is a photo and film ban at every facility run by the railways. That goes for stations, inside trains, but also for bicycle parking facilities. Although the staff understands everybody wants to take pictures so shortly after the opening, they did ask me to abide to the general rules and to “stop taking pictures”. Fortunately, only after I had already filmed for almost an hour. Since I had no other business there, it effectively meant I was to leave and I did. When I joked about “being kicked out” on Twitter I had underestimated what the result of such an inconsiderate remark would be. Not only did the city’s office for the transformation of the station area respond on Twitter, they also sent me an e-mail right away to explain the situation and to apologise. Both this office and the city’s department for cycling kindly offered to arrange extra time for me to film. Even the Utrecht alderman for traffic got involved, so the joke got a bit out of hand! In the end, I really only missed one shot –of the 720 OV-Fietsen– and footage of those bicycles was kindly offered to me by Martijn van Es, you’ve seen his name before in this post, the spokesperson of the Cyclists’ Union. Thanks to everyone who wanted to make sure I got the images I needed for this week’s video! 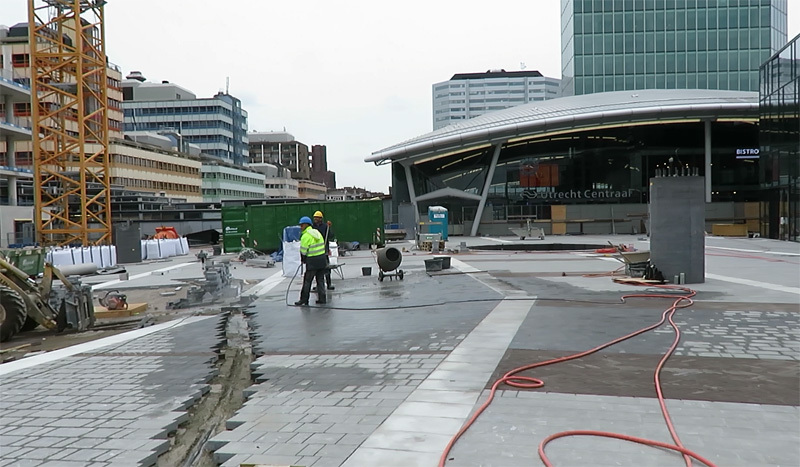 The new Utrecht station square under construction, in May 2017. Since then, huge scaffolding was placed here to build the gigantic roof. On YouTube you can see images from a drone flight over the works in progress. Finally, some last facts and figures. The facility has only one entrance for cycling so far (another one will be built). After you enter you decide where you can or want to park on one of the three floors, one of which is underground. There is a special area for 272 bigger bicycles and there is an area with 1,800 spaces for people with a subscription. The rest is for people that simply use their public transport chip card. If you don’t have such a card you can get a temporary one from the staff that you return when you check out your bicycle. The first 24 hours of parking are free. After that ordinary bicycles cost €1.25 for every consecutive 24 hours, while people with ‘special’ bicycles such as cargo bikes and the ones with baskets and children’s seats pay €1,50. For people living in another city, who need to leave their bicycles here for longer periods, there is a subscription that is on offer until November for just €55 a year. The garage is open 24/7 and always guarded. A dynamic guidance system (telling visitors where there are still places available) will be installed at the end of the summer. It will also be connected to the city’s Dynamic Bicycle Parking Guidance system. From then on bicycles that have been parked for over 28 days (without a subscription) will be removed. In future, the ramp on the left will continue to make cycling possible. But the part of the building that the ramp will lead through is not there yet. Therefore, temporary stairs were placed to be able to reach the other floor that way, until the rest of the building is finished. 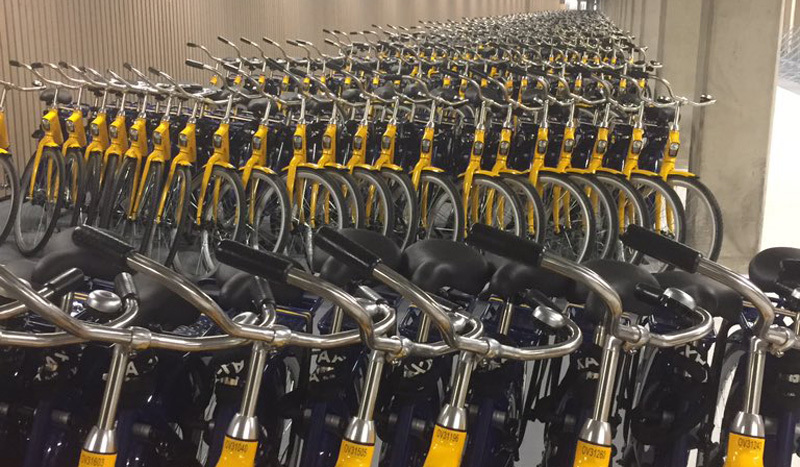 The “sea” of 720 shared bicycles in the new Utrecht OV-Fiets rental station. Picture kindly sent to me by Utrecht Fietst after I told the world I wasn’t able to film these bicycles. 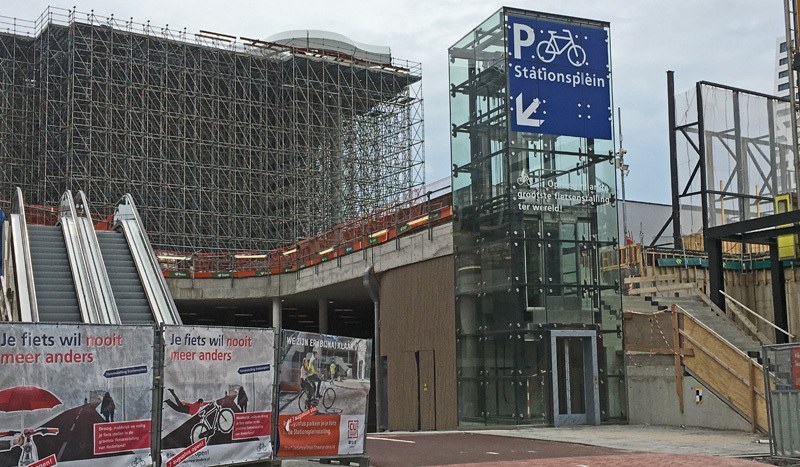 The Utrecht ‘Stationsstalling’ (Station’s bicycle parking facility), as it is apparently called, will be officially opened on 21 August next by the Utrecht alderman for (the reconstruction of) the station area and two regional directors of both railway companies. 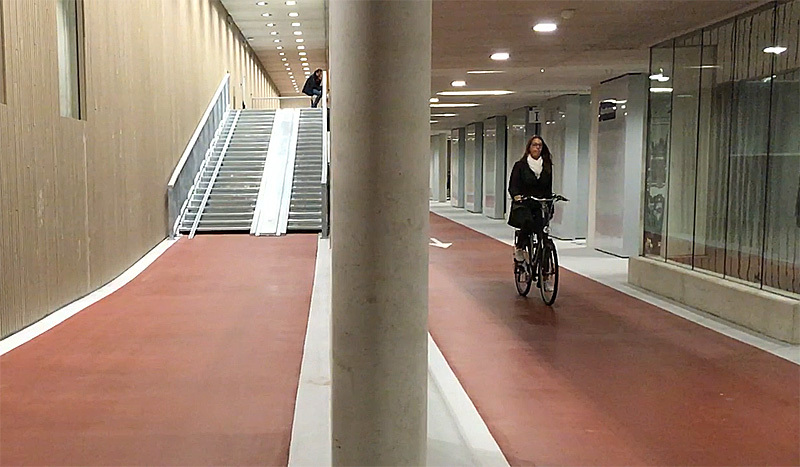 This week’s video showing the new Utrecht bicycle parking facility. This has to be one of the best looking parking facilities, of any kind, that I have seen. Come to think of it, most of those are located in the Netherlands. The city of Los Angeles is far behind the bicycle infrastructure of the Netherlands in terms of quantity per population and quality, but LA is creating a wider variety of activities and infrastructure for bicycling that is laying the seeds for growth in bicycling in the future. According to one of LA’s 15 council members, CicLAvia is the greatest political motivator to do things for bicycling. Here’s a video of a recent 7-mile long CicLAvia event that took place for the first time in the southern end of the city of LA, in the port area. Here’s some photo’s of the event. “Far behind”? There is very easy solution to that – tell everyone to give up their cars and ride a bicycle instead. I find it very difficult to believe that most people wouldn’t. The LA area is going through some changes that could significantly increase the amount of driving. First, in 2015, undocumented immigrants were able to obtain drivers licenses legally. Now, the minimum is in the process of almost doubling from less than $8 an hour to $15 an hour. One of the first cities in California that will reach a minimum wage of $15 an hour will be Los Angeles, which its own increase to $15 before the state did. LA will have a $15 an hour minimum wage by July 1st. 2020. These increases are very likely to have an impact on how many people take transit and perhaps ride a bicycle. The last annual survey by LA county Metro on the average household income of their bus riders, which was taken a couple of years ago, was less than $17,000 a year. The only organization that counts bicyclists and pedestrians in the city of Los Angeles is the Los Angeles County Bicycle Coalition. Their last count was in 2015 and consisted of 50 intersections (about 260 intersections are needed to give a statistically accurate count for the entire city of LA).. It showed a bicycling drop of 9% from the previous count which was conducted in 2013. That may be partially caused by undocumented immigrants obtaining drivers licenses in 2015. There is also a annual household survey conducted by the federal Census Bureau that indicated a drop of about that percentage in the city of Los Angeles for bicycle commuting in 2015. These results give a strong indication of a drop in bicycling for the city of Los Angeles in 2015. I suspect that almost doubling the minimum wage will have a bigger impact on lowering the rate of bicycling in the city of Los Angeles because much of the bicycling in LA is coming from people that are too poor to own a motor vehicle. Doubling the minimum wage makes it much more likely that households in the Los Angeles area can afford a motor vehicle. It doesn’t lower the price of the product, but it raises the amount of money available for people to purchase it. The solution is to tell everyone to get rid of their cars and ride a bicycle. If they don’t know why tell them all the wonderful benefits – they’ll be healthier, trimmer, feel better and overall health care costs will be significantly reduced. They will save thousands of dollars a year on car ownership costs. There will be no air pollution. no noise pollution, the culture will be friendlier and in general everything will be significantly better. Plus it’s fun! I can’t figure out why people would not want to use a bicycle as their major form of transportation. Are most people physically lazy? Is it accessible with a three wheel trike? OV fiets is very cheap but not for every day but is there anything targeted towards people who need a bicycle just to make the last two or three miles from the station, something like Velib in Paris? These are essentially free to use after an annual €29 charge, except you are limited in where you can take them. Then you can reduce the number of bikes that need to be parked here, or in the city center. About front racks: Typically, the bikes are staggered, with the handlebars overlapping. A rack as wide as your handlebars would obstruct the bikes next to it and likely wouldn’t fit. A small front rack usually does fit, but a front basket or crate is a problem in these racks. I’m not sure a bike sharing system such as exist in other cities outside The Netherlands would work as well here. First of all, when people use it mainly for commuting instead of tourism, then there’s going to be a dominant flow leaving docks at train stations empty during the day and full in the evening. Since these docking stations are not as space efficient as normal bike parking, they’d take up quite a lot of space for the required number of bikes and the effective extra number of trips may not be that big, since way fewer people use these bikes for non-commuting trips during the day. I’ve seen this happen in London at the University I worked: all docking stations around it would fill up around 9am and empty around 5pm. I like the open structure of the temporary 2.5k bicycle parking next to Amsterdam Central Station. Build to be temporary between 2001 and 2004 and then prolonged a bit and renovated in the meantime. When you leave it with your bicycle, there is at least one tourist taking a picture of you and the structure. Quite an honour. If the temporary structure is demolished the mass of bicycles become invisible in public space. I mean, they are not cars, they are beautiful, important bicycles. What message do you give to the general public if you tuck them underground? We can only hope it will become a monument before 2023, when the new parking beneath the canal opens. An extra 2.5k parking spots are always welcome. It would make a great story: “Temporary bicycle parking becomes monument.” It already has it’s own entry ‘fietsflat’ in the Dutch wikipedia. https://fietsflatmonument.petities.nl in Dutch and https://fietsflatmonument.petities.nl?locale=en in English. Wir haben in Deutschland leider noch einen sehr weiten Weg zu gehen. Mark, you mention that the Tokyo Kasai facility has parking for 9,400 bicycles. Tokyo also has about 3 miles of bike lanes and paths. About the only bicycle infrastructure in the entire country is parking. 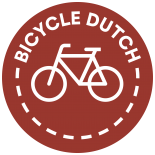 This entry was posted on 15 August 2017 by Bicycle Dutch in Original posts and tagged cycle parking, exceptional cycling infrastructure, railwaystations, underground parking, Utrecht.